Dr. Uta Wehn is Associate Professor of Water Innovation Studies in the Integrated Water Systems and Governance Department at IHE Delft. She is a social scientist from the field of science, technology & innovation studies, with a background in ICTs, drawing on more than 20 years of combined industrial, research and international development experience. Her work at the intersection of data and knowledge co-creation, digital innovations and water and environment focuses on the social dynamics of innovation and how to harness digital transformations for participatory environmental governance and sustainable development. She leads the acquisition and implementation of large interdisciplinary research and capacity development projects. Her current Citizen Science projects include case studies in Europe, the Middle East and Africa, using LivingLabs principles and tailoring user-centred and multi-stakeholder co-design methods to Citizen Science. She has extensive experience with teaching, MSc and PhD supervision and the facilitation of multi-stakeholder interactions in a range of thematic settings and cultural contexts. She has over 70 publications in peer-reviewed journals, international conference proceedings and book chapters in the areas of citizen science, citizen observatories and environmental monitoring; participatory environmental governance; stakeholder engagement; co-design methods; business modelling; capacity development and knowledge management; data and knowledge sharing; social innovation and water innovation dynamics. She is a member of several high level international initiatives, incl. the OECD Water Governance Initiative where she has represented IHE Delft since the start of the initiative in 2013. Wehn, U. and Montalvo, C. (2018) Exploring the dynamics of water innovation: Foundations for water innovation studies, Journal of Cleaner Production, 171(S), 1-19. Wehn, U. and Montalvo, C. (2018) Knowledge transfer dynamics and innovation: Behaviour, interactions and aggregated outcomes, Journal of Cleaner Production, 171(S), 56-68. Mazzoleni, M., Cortes Arevalo, V.J., Wehn, U., Alfonso, L., Norbiato, D., Monego, M., Ferri, M. and Solomatine, D., (2018) Towards assimilation of crowdsourced observations for different levels of citizen involvement: the flood event of 2013 in the Bacchiglione catchment, Hydrology and Earth System Sciences, 22, 391-416. Wehn. U., Collins, K., Anema, K., Basco-Carrera, L. and Lerebours, A., (2018) Stakeholder engagement in water governance as social learning: Lessons from practice, Water International, 43(1), 34-59. Mvulirwenande, S., Wehn, U. and Alaerts, G. (2018) Policy factors explaining the failure of delegated management in water supply: evidence from Ghana, Water International, 1-17. Mvulirwenande, S., Alaerts, G. and Wehn, U. (2017), Evaluating Capacity Development in the Water Sector: Challenges and Progress, Water International, 42(4), 372-384. Member of the Editorial Board of Prometheus - critical studies in innovation. Download journal profile here. Supervision of five PhD fellows: Abeer Almomani, Alexander Imbo, Kim Anema, Mohammad Gharesifard and Christiana Metzker. The potential of using Citizen Science approaches and new digital technologies in a suitable setting for experimenting and generating new EO products and services is faced by social, scientific, technical and economic challenges. This requires a dynamic approach in which the facilitation of interactions amongst actors, incl. citizens, the wider public, NGOs and non-Space sector actors, takes centre stage in accelerating EO data-related innovations and their use. The CSEOL project (ESA-funded) engages a wide community of users of EO data and providers of information to support the validation and exploitation of EO with citizen science. The physical CSEOLab is placed at the premises of IHE Delft and forms a central place for idea generation and the co-design of CS EO projects, featuring new digital technologies and tools for CS and EO, the wider CS community as well as non-Space actors such as schools, Civil Society Organisations, etc. CSEOL serves to catalyse the potential of CS for EO into concrete, funded and achievable pilot projects. The MICS project (H2020, 2019-2021) brings together a transdisciplinary team to address a scientific and policy priority area where citizen science has the potential to promote a paradigm shift. Nature-based solutions (NBSs) are actions to protect, sustainably manage and restore natural or modified ecosystems that address societal challenges and provide human well-being. The MICS project ising support NBS research by developing strategies and tools to evaluate impacts on science and society resulting from the integration of citizen science. These tools foster citizen science approaches that increase both scientific knowledge, and capture how scientific evidence is taken up by communities and policy makers. MICS uses novel impact-assessment metrics and instruments that measure costs and benefits of citizen science in relation to the NBSs, with particular attention in the domains of society; democracy; the economy; NBS science, and citizen scientists. Citizen observatories enable citizens (and not just scientists and professionals) to collect and share data about the environment. Ground Truth 2.0 strengthens the feedback-loop in the information chain: from citizen-based data collection to knowledge sharing for joint decision-making and cooperative planning. The overall objectives of Ground Truth 2.0 are to implement sustainable citizen observatories for the demonstration of their societal and economic benefits, and the global market uptake of the Ground Truth 2.0 concept and enabling technologies. The project uses a trans-disciplinary approach which consists of a multi-actor innovation process to combine the social dimensions of citizen observatories with enabling technologies so that their customisation and deployment is tailored to the envisaged societal and economic impacts of the respective observatories. It focuses on environmental indicators in urban and rural areas related to spatial planning issues, with a specific focus on flora and fauna as well as water availability and water quality for land and natural resources management. This is supported by an innovative web-based service for worldwide mapping and updating of land use. The demonstration cases (4 EU and 2 African) cover the full 'spectrum’ of citizen-sensed data usage and citizen engagement, and therefore allow testing and validating of the concept and technologies, and evaluation of their impacts under a range of conditions. The Ground Truth 2.0 consortium consists of 14 partners, from industry, SME, NGO, government, research and academia. (Funding: H2020, 2016-2019). WeObserve is an H2020 Coordination and Support Action (CSA) which tackles three key challenges that Citizens Observatories (COs) face: awareness, acceptability and sustainability. The project aims to improve the coordination between existing Citizen Observatories and related regional, European and International activities. The WeObserve mission is to create a sustainable ecosystem of Citizen Observatories that can systematically address these identified challenges and help to move citizen science into the mainstream. The specific WeObserve are to i) Develop communities of practice around key topics to assess the current CO knowledge base and strengthen it to tackle future environmental challenges using CO-driven science; ii) Extend the geographical coverage of the CO knowledge base to new communities and support the implementation of best practices and standards across multiple sectors; iii) Demonstrate the added value of COs in environmental monitoring mechanisms within regional and global initiatives such as GEOSS, Copernicus and the UN Sustainable Development Goals; and iv) Promote the uptake of information from CO-powered activities across various sectors and foster new opportunities and innovation in the business of in-situ earth observation. The main objective of AfriAlliance is for African and European stakeholders to work together in the areas of water innovation, research, policy, and capacity development to prepare Africa for future Climate Change challenges. There are many but fragmented initiatives and networks in place, therefore AfriAlliance will not create new but will consolidate existing networks of scientists, decision makers, practitioners, citizens and other key stakeholders into an effective, problem-focused knowledge sharing mechanism via an overall coordination platform: the Africa-EU Innovation Alliance for Water and Climate. AfriAlliance will support them in identifying appropriate social innovation and technological solutions for key water and climate change challenges. AfriAlliance will take Africa-EU cooperation in this field to a practical level by sharing (non)technological innovation for local challenges, thus also identifying and boosting sustainable market and investment opportunities. Demand-driven, problem-focused Action Groups will share knowledge between the identified stakeholders and networks at all scales to effectively identify and address vulnerabilities. We will make extensive use of existing/emerging communication channels and events (EU/African platforms, conferences, social media) to streamline Climate Change issues into water-related networks to raise awareness about their impacts and propose adaptation measures. AfriAlliance will re-enforce and valorise Water and Climate Change research and social innovation (R&I) cooperation between Africa and Europe through a mix of forward-looking and bottom-up innovation and road mapping techniques. The project will identify demands, opportunities, and constraints at different levels and develop strategic advice (short term demand-driven R&I outlook and long term R&I agenda) for improving Africa-EU collaboration. This will help policy makers to create a consistent approach to bilateral cooperation between Africa and the EU in the field of innovation for water and climate. (Funding: H2020, 2016-2021). The 2-year project “Women and Water for Change in Communities” aims to strengthen the role of women as sustainability change agents in rural African communities. Using an Action Research approach, the project is supporting local women and youth groups in assessing the state of their water and natural resources, and engage in decisions affecting long term sustainability and social wellbeing. The initiative combines training, citizen-based monitoring and entrepreneurship opportunities for and led by women. Throughout sub-Saharan Africa, environmental pressures are acute, as the degradation of natural resources threatens livelihoods and future prospects. Community-based stewardship of ecosystems and natural resources is a core aspect of the global effort to set societies on a more sustainable trajectory. But rural communities, while often aware of degradation in their local environment, rarely have the means or institutions to effectively address problems in an integrated way. Resulting gaps in water management and degrading ecosystems affect women and girls disproportionately, through time needed for fetching water, missed opportunities for education, and diminishing returns of economic activities dependent on degrading natural resources. Increasing female leadership in water-related decisions is, therefore, seen as a key tool for promoting equity and sustainable resource use alike. “Women and Water for Change in Communities” promotes women leadership in water-related decision-making, supporting them in improving local use of water, sustainable natural resources management and public health. Activities focus on training for effective participation in decision-making, a seed grant scheme and training for women entrepreneurs improving the sustainability of local value chains, and the development of locally relevant citizen-based monitoring schemes with the potential to changing power relationships in resource management. The project follows an Action Research philosophy, documenting and reflecting on changes in local attitudes in parallel to all activities, to track how change comes about and how it is perceived. The project works with local communities in three action sites, the Mara Bay and Masirori Swamp in Tanzania, the wildlife conservation area of the Silowana complex in Zambia, and the Mabamba Bay wetland system in Uganda. All three communities depend on degrading natural resources, and all have recently developed an integrated management plan in multi-stakeholder consultations that they are now challenged to implement. This provides a diverse but coherent frame to experiment with innovative tools for women empowerment (Funding: The Coca Cola Foundation, 2017-2019). In the face of increasing challenges, water resources management relies on strong human, organisational and institutional capacity, yet this is lacking in many developing countries and, in practice, it remains challenging to strengthen knowledge and capacity across the board, in multiple government institutions, civil society, the private sector and knowledge institutes. One of the main outcomes of recent events held at IHE Delft (5th Delft Symposium on Water Sector Capacity Development) taking stock of the situation was a call for ‘national strategies for water sector capacity development’. Such strategies can help to ensure that the knowledge and capacity to maintain water services and water resources are strengthened in a synchronized and sustained manner where they are needed – locally - and that new investments avoid the failures of the past resulting in a patch work of uncoordinated CD efforts or too often focusing on infrastructure alone. Some countries have already embarked on developing and implementing such strategies while others are only at the beginning, deliberating their necessity. In this project, IHE Delft is supporting the national processes of developing or implementing strategies targeted at water sector capacity development in three countries in Asia, Africa and Latin America: Indonesia, Uganda and Colombia. Uta Wehn is leading this Action Research and Capacity Development project which aims to support these strategizing processes, to provide opportunities for the three countries to learn from each other, and to produce guidance material on how national CD strategies can successfully be developed and implemented (Funding: DGIS, 2014-2015). BEWOP (Boosting Effectiveness in Water Operator Partnerships) is a 5-year research and outreach initiative aimed at boosting the effectiveness of WOPs (Water Operator Partnerships) around the world. BEWOP, launched in September 2013, is a collaboration between IHE Delft and UN-Habitat’s Global Water Operators’ Partnership Alliance (GWOPA), the organization leading the global WOPs movement. BEWOP aims to address a potential paradox of the WOPs approach: operators are uniquely placed to share their experience and technical expertise with their peers, yet they sometimes lack the didactical capacity to effectively transfer their knowledge and the ability to manage the partnership process. The goal of BEWOP is to strengthen knowledge transfer and change processes in WOPs in order to maximize the potential for operational improvements of water operators. Uta Wehn leads the activity on Knowledge Management between and within water operators. More information about the project can be found here. 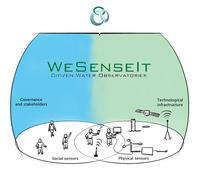 In order to harness environmental data and knowledge to effectively and efficiently manage water resources, the WeSenseIt project developed citizen observatories of water. The key aspect of WeSenseIt is the direct involvement of user communities in the data collection process: WeSenseIt enables citizen involvement by collecting data via an innovative combination of easy-to-use sensors and monitoring technologies as well as harnessing citizens collective intelligence, i.e. the information, experience and knowledge embodied within individuals and communities. The citizen observatory of water were tested and validated in three case studies in water management in collaboration with water management and civil protection agencies in the UK, the Netherlands and Italy. These case studies cover the entire hydrologic cycle with a major focus on variables responsible for flood and drought occurrences. (Funding: EC FP7, 2012-2016). In the WeSenseIt project, Uta Wehn lead the Governance and Social Innovation work package and she was the Deputy Scientific Director, with a special focus on innovation. Chittagong Water Supply & Sewerage Authority - Utility Modernization Umbrella Consultancy Strengthening the capacity of CWASA in the operation and maintenance of water utility services and supporting the modernisation of its operational structure, systems and process. IHE Delft contribution: Capacity Development and Training Plan and Utility Maturity Score Card (Funding: International Development Association (IDA) and Republic of Bangladesh, 2015-2017). SUSWAS (Public Private Partnership for increased Access to Sustainable Water services in Rwanda). The project focusses on five main goals, namely i) Reducing Non-Revenue Water; ii) Increased efficiency of a water treatment plant; iii) Access to safe water for 50.000 people in peri-urban ( low income) areas in Kigali; iv) Improved sustainable functionality of rural water infrastructure; and v) An internal training center established at WASAC & staff educated (Funding: Sustainable Water Fund, 2013-2017). Capacity Development for Performance Improvement of water utilities in secondary urban centers in East Africa. The project aims at improving the operational performance of three East African utilities (Rift Valley Water Services Board (RVWSB) Kenya, Electricity, Water and Sanitation Authority (EWSA) Rwanda, Dar es Salaam Water and Sewerage Company (DAWASCO) Tanzania) and strengthening the capacity development skills of the National Water and Sewerage Corporation (NWSC) Uganda in the three thematic areas of governance and management, revenue enhancement and services provision to the poor (Funding: ACP-EU Water Facility Programme, 2011-2015). MRC module-based competency framework for IWRM Support to the Mekong River Commission for developing a module-based IWRM Competency Framework. This framework aims (1) to familiarize the MRC Secretariat, NMCs, Line Agencies and related stakeholders with updated concepts and definitions about IWRM, Transboundary IWRM, competencies, knowledge and capacity development, (2) understand which core Transboundary IWRM competencies are necessary to develop in the MRC context, (3) obtain tools to analyze the current competencies, and (4) identify required competencies for recruitment of staff, career development paths and capacity needs assessments. (Funding: Mekong River Commission, 2012).